Today is as good a day as any to look at the actual game. Which has Darth Vader turning into a shark. In case you couldn't tell by the fact the manual contained enemies like a giant scorpion and a pterodactyl, Namco's 1987 interpretation of Star Wars isn't exactly canon. 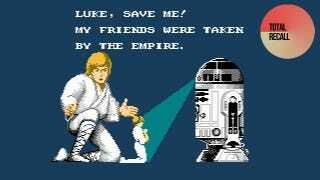 As posted over on VGJunk earlier today, the game is a loose collection of Star Wars set pieces, bizarre crossovers and levels and locations that were clearly cannibalised from other games. Unless we somehow missed the part where there are ancient Egyptians buried underneath Kessel. Maybe it's in George Lucas' next re-release! Aside from the fact there are Egyptian, underwater and floating-platforms-in-the-mountains levels, the game's big bizarre twist on the source material is that, like in Mario, you fight Vader at the end of most levels. Though, you don't really fight Vader. You fight Darth Vader who turns into a giant scorpion, and you end up fighting the scorpion. Same deal with a skeleton pterodactyl. And a giant shark. To see the absurdity for yourself, check out the gallery above.